Creel and DaVinci take home the Reserve Championship in the Low Junior Jumpers at WEF. Photo The Book, LLC. 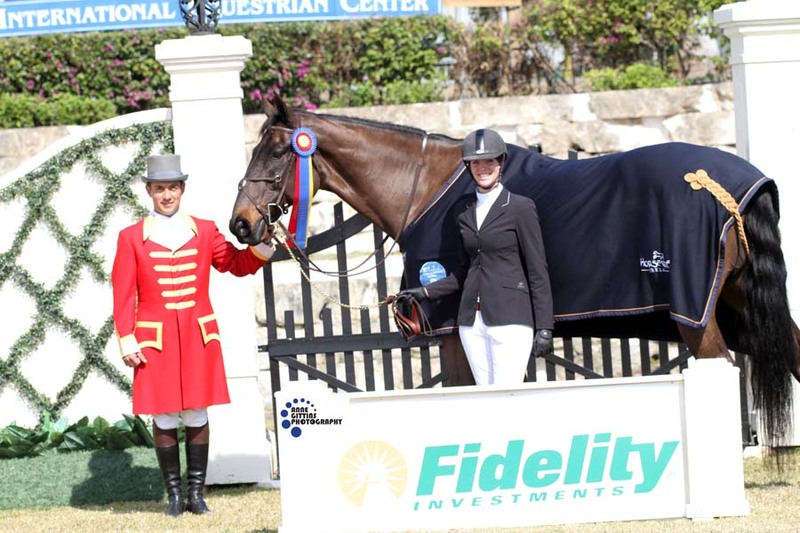 Wellington, FL – February 4, 2014 - Lynn Jayne’s Our Day Farm of Elgin, IL, has been enjoying the Florida sunshine and some big victories at the FTI Consulting Winter Equestrian Festival Horse Show in Wellington, FL. Jayne takes her customers to the Palm Beach International Equestrian Center where they spend 12 weeks competing against the best horses and riders in the country. Caitlin Creel and DaVinci capture the $10,000 Low Junior Jumper Classic at the Winter Equestrian Festival. Photo by The Book,LLC. Caitlin Creel, 17, of Kildeer, IL, was one of Jayne’s big winners, clinching the blue in the $10,000 Low Junior Jumper Classic in week three of the series aboard DaVinci, owned by Cavallo Farm of San Diego, CA. Creel and the 12-year-old Dutch warmblood gelding also took home the Reserve Championship in the division. Creel has been winning other top ribbons on the gelding in previous weeks out of over 50 junior riders competing. Creel has her sights on qualifying for the Medal and Maclay Finals and moving up to the High Junior Jumpers since this is her last junior year. Another big winner for Jayne’s farm is Kaitlyn Calamos and Tuxedo, who walked away with the Championship in the Low Adult Jumpers 18-35 and won the $1,500 Low Adult Jumper Classic in week two. Continuing her winning streak, Calamos, 20, of Batavia, IL, and Tuxedo, owned by Kim Calamos, also won the classic again in week 3 and the Reserve Championship. After just arriving and thawing out from the chilly Chicago winter, Calamos and the 14-year-old Holsteiner gelding, were third in the classic the first week, wasting no time getting into the groove. Not to be left out is Jayne’s daughter, 10-year-old Natalie who’s been at the top of the jog every week in the Small/Medium Children’s Pony division with Malibu. Malibu is a 13-year-old New Zealand warmblood owned by Camille Trimble of Westlake, TX. Young Jayne jogged second multiple times in week 1, was Reserve Champion week 2, and won a class week 3. Natalie has also been in the ribbons on her small pony, Dress Code, in the Small Pony Hunter Division. Jayne and her customers continue showing at the Winter Equestrian Festival until the end of March. For more information on Our Day Farm, email Lynn Jayne atlynnjayne@comcast.net or phone 847-721-8595. For more information on the Chicago Hunter Derby, please visit www.Chicagohunterderby.com.